I’ve spent a lot of time as Under Secretary for International Trade focused on the Asia-Pacific region — and for good reason. Case in point: the recent deal in which Lion Air, an Indonesian airline, ordered 230 Boeing airplanes valued at more than $22 billion. It’s the largest commercial aircraft order in the history of the company, and its impact goes way beyond the numbers. 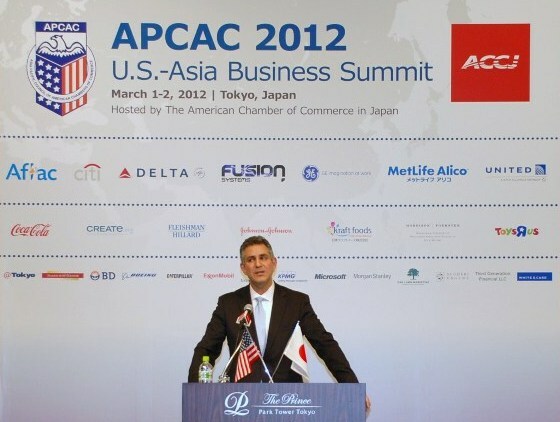 Under Secretary Sanchez in Tokyo, Japan March 2 as a keynote speaker at the Asia-Pacific Council of American Chambers of Commerce (APCAC) U.S.-Asia Business Summit. This deal benefits all those who make and transport the parts that make up these aircraft. It helps the workers who assemble the planes. In short, it supports good-paying American jobs and benefits entire communities. There is great potential for more U.S. businesses — both large and small — to have a similar impact, and I am determined to help fulfill this promise. During my tenure, I’ve probably spent more of my time abroad in the Asia-Pacific than any other area of the world. For example, last year, I led the largest-ever higher-education mission to Indonesia. I also visited Hong Kong with 19 American businesses on a biotech mission. Our work in this region is a priority for us, and good things are happening. U.S. goods exports to the broader Asia-Pacific totaled nearly $900 billion in 2011, a 15 percent increase from 2010. This is equal to 60 percent of total U.S. goods exports to the world. These are positive signs, and as you’ll read in this International Trade Update, the Obama Administration is committed to building on this progress by opening new doors of opportunity for U.S. businesses. One way is through policy. We are working to advance the Trans-Pacific Partnership, one of the most ambitious trade agreements ever crafted. It holds great potential for U.S. businesses to sell their products in a region with nearly three billion consumers, and we continue to talk with our TPP partners with the goal of finalizing the terms. Another important policy milestone took place on March 15th, when the U.S. – Korea Trade Agreement took effect. I highlighted the importance of this development in publications like The Tampa Tribune. It will provide big benefits for U.S. businesses. Before, in a variety of sectors, U.S. companies had to pay a tariff rate to sell their goods and services in Korea. Now, many of these same companies can enter the market duty-free. Almost 80 percent of American exports of industrial products to Korea will enter without getting taxed. Estimates are that this will lead to roughly $11 billion in additional U.S. exports. The trade agreement will also provide new opportunities in the 12th-largest economy in the world. The International Trade Administration is committed to linking U.S. businesses with these and other opportunities throughout the Asia-Pacific. Earlier this month, I was in Japan doing just this by advancing commercial relations. I gave a keynote address to the Asia-Pacific Council of American Chambers of Commerce, a group of 27 member-chambers from across the region. I also participated in the Asia-Pacific Business Outlook Conference, where U.S. businesses met with 16 of our Foreign Commercial Officers from the area to explore new possibilities for doing business abroad. It was a tremendous success and will go a long way in helping American companies succeed in the Asia-Pacific. Despite the nearly 4 million private-sector American jobs created in the past 24 months, our nation can’t stand still. We can’t be satisfied. Accordingly, ITA is committed to taking steps forward — both large and small — in the Asia-Pacific that will bring a more prosperous future for American workers, businesses and the overall economy.